“Tower of Voices” is 93 feet tall with 40 chimes, honoring American Flight 93 and those who perished while crash-landing the plane. Today marks the 17th anniversary of the 911 attack on this nation, which hit New York’s iconic World Trade Center, the Pentagon, and a farm field in Shanksville, Pennsylvania. The heroes of United Airlines flight 93, who brought down the plane before it could return to Washington D.C. and slam into the White House, are being honored with an innovative memorial. In a field amid the rolling hills of central Pennsylvania stands the “Tower of Voices.” Ninety-three-feet tall, it honors the heroes of Flight 93. It will be dedicated later today, the last piece of this 2,200-acre memorial that includes the crash site, known as the sacred ground; a visitor center that tells the story of Flight 93; and the wall of names built directly under the flight path. 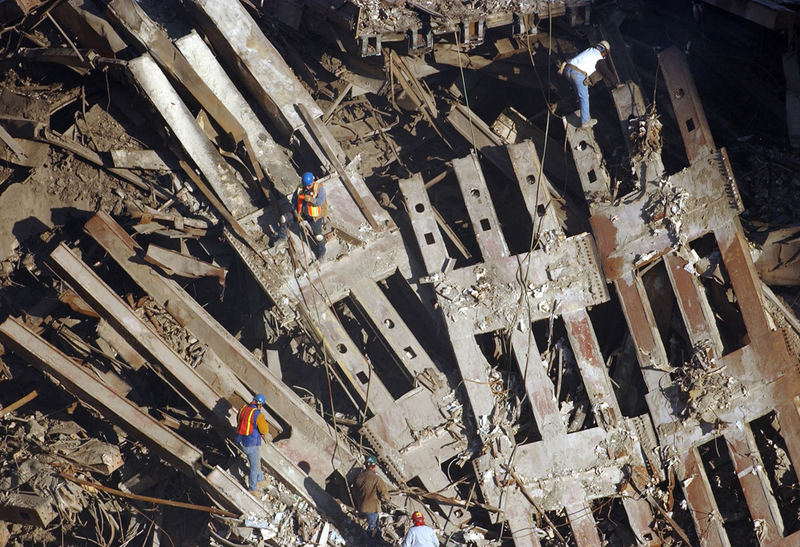 The tower, still a work in progress, holds eight wind chimes, but soon there will be 40 – one for each passenger and crew member who died here on September 11, 2001. The tower stands at 93 feet, for the flight number. There are 40 chimes, each one representing a life taken by the four terrorists who hijacked the plane. The chimes are the final phase of the memorial’s construction, and the piece will stand close to the entrance of the site. The final installation is as much work of land art as memorial: A visitor’s center of permanent and temporary exhibits sits at the edge of a giant bowl-like field that looks out at the impact site. From there, a one-mile-long path winds along the edge of the bowl with a long, sloping black wall that marks the edge of the crash site. In the distance are the fields and woods where the final remains of the passengers and crew members rest. Beyond the site sits a hemlock grove damaged by the crash, as well as a giant rock that marks the impact site. Only family members are allowed to enter the field. As the visitors’ path winds its way along the edge of the field, benches offer places of contemplation, and there are also places to leave personal offerings. Finally, there is ‘The Wall of Names,’ a series of forty white marble panels each inscribed with the name of a murdered passenger or crew member. The wall leads to a wooden ceremonial gate where visitors can stand and look down the actual flight path to the impact site. The design was inspired by the desire to add the sense of hearing as an approach to memorializing the victims. Architect Paul Murdoch, the mind behind the Flight 93 National Memorial, says it’s the voices of the 40 passengers and crew members aboard the downed United Airlines plane that linger with him. That’s why his proposal for the 2,200-acre National Park Service-operated site called for not one but two phases. First came the Wall of Names, etched in white marble. Now, the Tower of Voices, a 93-foot-tall precast concrete structure with 40 of the world’s largest chimes. “It starts with the wind,” says Elizabeth Valmont, an acoustics expert at the design firm Arup and acoustic lead for the chimes. The tower stands sentinel over the site, she says, with 40 independent polished aluminum chimes, between 5 and 9 feet in length, nestled within. Each chime represents an individual aboard the flight, and together they engage in an eternal “conversation,” but only as the currents guide them. Prayers are being said today, for the victims of 911 and their families. Thank you AA Flight 93 heroes. You answered the call. I remember visiting Ground Zero when I returned to Manhatten for the first time after 9/11, about 3 years later. And I could still hear the screams of agony from the pit that it still was. The open rectangular slots in the memorial tower are reminiscent of the shattered rectangular remains of the WTC building after he collapse. It was United Airlines Flight 93! It is ironic that Flt 93 was the first American counter attack of the US-Islam war. The war truly started with the bombing of the Trade Towers in 1993, see the connection. It was treated as an act of isolated terrorism and nothing was really done to counter the rising threat of Islamic aggression against the US and the West. So, eight years later, 9/11/2001, the largest attack against mainland US interests was carried out by Islamic actors. The US response was overwhelming and strategic; the invasion of Afghanistan and Iraq. It went very well. Then the Establishment of this country sold it out, again. We knew that Osama bin Laden was no longer in Afghanistan within a year of the invasion. By the middle of 2003, there was no reason for any significant number of US troops to be within that country. Yet, we still committed a huge military force and sank billions into the country, for no good reason. Nation building was never going to work there. The invasion of Iraq was for the sole purpose of allowing the US to have bases in the Middle of the Middle East, right next door to Iran housing some 60,000-80,000 troops. The influx of Islamic jihadists was simply an unforeseen benefit, as it allowed us to almost wipe out the Islamic terrorist network outside of the Hezbollah network. We managed to stabilize Iraq to the point where sectarian violence was at a minimum and we had several huge military bases constructed to house US troops. Then, the quislings in the US government struck and made all the sacrifice moot. All that the US had accomplished was watered down by the Bush administration in the last couple of years of that Presidency. The Obama presidency not only made it possible for Islamic jihadism to grow, but encouraged it. We saw the rejuvenation of Al Qaeda, the birth and expansion of ISIL/S, the reemergence of the Taliban, the rise in importance of the Muslim brotherhood, the Syrian civil war, Erdogan pushing Turkey farther into the fundamentalist Islamic camp and Iran get a second wind. And, still we hear the liberals chant that Islam is a friend to the United States. We learned nothing from 9/11. We are fighting the same wars, in the same places against the same people 17 years later. That sound that we hear on the plains of Pennsylvania is not a victory march. It is a funeral dirge. Not for the passengers and crew of Flight 83, but for the US. If we do not wake up and see reality for what it is. Exactly, Mac. I’ve been reading the 9/11 Commission report, and we STILL haven’t done the things recommended. And the TSA? It harasses us, for what purpose? If we were truly America First, and Americans First, we would bar all muslims from the U.S. and ban them from our flights. Then Americans could travel again with the respect and dignity we deserve. Until then, I’m not flying. Unfortunately the Flight 93 Memorial, originally named Crescent of Embrace, is actually a terrorist memorial mosque whose centerpiece, a half-mile wide Islamic-shaped crescent, points to Mecca. The Memorial Project said that they would eliminate the Islamic symbol shapes but they never did. Still a giant Islamic-shaped crescent still pointing to Mecca. A crescent that Muslims face into to face Mecca is called a “mihrab” and is the central feature around which every mosque is built. A mihrab can have a pointed arch or other shape as well but the classic mihrab (including the archetypical mihrab at the Prophet’s mosque in Medina), is crescent shaped. There are a dozen typical mosque features. Every one is present in Paul Murdoch’s Crescent of Embrace design, all on the same epic scale as the giant mihrab, and once these dozen typical mosque features are accounted for there is nothing left over. FLNI is 100% terrorist memorial mosque and is the largest mosque in the world by a factor of 100, dwarfing Mecca’s Great Mosque. When I exposed these Islamic features the Park Service and the Memorial Project strove mightly to cover them up. Instead of heeding the information from the ground about the intentions of the hijackers, the Flight 93 memorializers decided to reject the example of woken vigilance they were supposed to be memorializing and instead decided to interpret the warning that they were being hijacked as a personal affront, as if they were all being accused of INTENDING to honor the 9/11 terrorists. I only ever accused one man: architect Paul Murdoch. America hosted an open design competition and invited the whole world to enter. Of course our terror war enemies would enter and try to win a memorial to their heroes instead of ours. The law that created the Memorial Project even foresaw this possibility and forbade it. But the Project itself refused to be vigilant, and so the world’s largest mosque has now been built on the Flight 93 crash site, standing now as a mark of our failure to honor, by following, the woken vigilance of Flight 93. May they rest in peace despite our failures, and may we before too long honor, by following, the heroic fight for their own lives that saved ours. What would be the least alteration to the site that would destroy its function as a mosque? We should start thinking that way, to rescue this damned new problem. I had read that previously. I was wondering if it had been rectified. I’m very sorry to hear that it has not. Thank you, Alec, for bringing this up. Any words that I might have would surely be inadequate. So, some of what comprised my personal observance of the day. Audio of the FAA and NORAD Response to the September 11, 2001 attacks. (Contains some graphic language and material. 1hour 51mins in length). Mike Rowe’s post regarding who “epitomized bravery and sacrifice” in the person of Tom Burnett of Flight 93. 23:2 He maketh me to lie down in green pastures: he leadeth me beside the still waters. 23:3 He restoreth my soul: he leadeth me in the paths of righteousness for his name’s sake. 23:4 Yea, though I walk through the valley of the shadow of death, I will fear no evil: for thou art with me; thy rod and thy staff they comfort me. 23:5 Thou preparest a table before me in the presence of mine enemies: thou anointest my head with oil; my cup runneth over. Like DieJustasHappy says, my words would be inadequate. As they say, read the whole thing. I got into some trouble for calling him my shipmate. Apparently I wasn’t using the term correctly. It is true, we didn’t serve together in ships. But Dan had a certain affect on you. If you were his friend, you were a friend for life. Hopefully Dan made this man a friend on 9/11. I only barely knew Bob. I was working as a defense contractor at the same company. I worked on some of the same contracts he worked on. It would be a stretch to say he was in D.C. on some business that he and I worked on together, as I don’t know. His secretary lost it, as she had AT HIS REQUEST changed his travel arrangements from the night before when everyone else came back to the next morning. He was tired. She had killed Bob Penninger in her mind. You couldn’t console the woman. It was such a (bleeping bleetity bleep bleep) when the skipper of my reserve unit called me later that day. By November I was deployed. I wanted some. I wanted some pay back so bad. Still, I am not satisfied with my work. I want to go back and tear off another piece. I meant it was an (expletives deleted) RELIEF when I got my orders to deploy. Note, not in combat. Just to deploy. I am forever grateful to my contacts in Big Navy in D.C. for getting me as far forward as they did. And, to be fair, I probably did a greater service to my nation by working in the rear with the gear with our allies getting them to ready, train, and equip their own forces to aid us. And to provide intelligence support to force protection. The gallantry displayed must have taken place while in action against an enemy of the United States, while engaged in military operations involving conflict with an opposing foreign force, or while serving with friendly foreign forces engaged in an armed conflict against an opposing armed force in which the United States is not a belligerent party. My highest achievement medal was the Navy Comm. Just about everyone got one of those, as long as you didn’t spend too much time in the brig. Then Ikea would award you a Bronze Star.